This is a post I had written much earlier on a static web-page. Now I am importing it into the blog. It’s not such a bad idea to revisit Seth Godin’s work from time to time anyway. Enjoy. Shortly after I turned on the computer this morning, I decided that I will continue to write about Seth Godin and provide you with two great resources about smart marketing. I just finished reading the book and published my honest review on my blog. Posted by John W. Furst in Audio Series, Marketing, Seth Godin, Top Posts, Video Series on Sunday, April 18, 2010 has got 1 Comments. Seth Godin (↑) finally started tweeting or twittering as some call it. You do not believe me, then check this out. Certainly a statement that leaves room for interpretation. Average companies are looking for average people. They do not want to deal with heretics, unicorns or anyone who could surprise them. Surprise is a potential threat. What is tribal marketing anyway? Many large organization try to mold everything and everyone. It seems that small business organizations can change more quickly, and they have to. P.S. : Now we have to teach Mr. Godin the twitter interface since this short piece of text was still posted on his blog. Posted by John W. Furst in Business Strategy, Consulting, Seth Godin on Wednesday, November 18, 2009 has got 1 Comments. Personally I am so sick of all this recession talk. It's everywhere. Now I am reading 50 job applicants for each job opening in the United Kingdom. That number by itself doesn't say anything. I don't get it why mass media always distorts reality and makes it appear more negative than it is. People should stop buying into this “negativity reporting”. It has been historically proved that a recession is actually a good time to start off a new business. I know that self-employment or being an employer is not for everyone,... That's true. But if you have it in your veins t work for yourself than you'll appreciate the following interview with Seth Godin. Even if you are working as employee you can get some take aways from this interview and help change the organization you are involved with for the better. Many businesses are on the wrong track without even knowing it. You do not want to miss this interview. 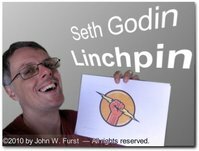 Posted by John W. Furst in Audio Series, Coaching, Marketing, Seth Godin on Saturday, January 24, 2009 has got 2 Comments. Now it's offical: “Stay Hungry” has been chosen as the best career advice for lesson 7 of Daniel Pink's book. “I'm going to TED, but those whose stories are told on the blog at beckyblanton.com are going with me. In the coming months the blog will be redesigned in order to highlight and showcase those people who are both ‘Staying hungry’ AND ‘Saying Thanks’ as Ed Brenegar and I team up to spread OUR ideas. In July I'll be blogging and vlogging about TED on that site as well. Thanks to those of your who have supported my call for help. I know you are many. That brings me to the second part of this blog post. Posted by John W. Furst in Coaching, Email Marketing Tips, Marketing, Video Series on Tuesday, January 20, 2009 has got 3 Comments. We'll have another beautiful day that's probably why I got up at 7am this morning. While I was making myself breakfast, I thought about the question whether ads do work or not. Honestly I did not think more than a second about my answer. Here it is. Small and large direct marketing companies know it. Many successful Internet marketers know it. While Seth Godin writes about brands, meatballs and social media (↑) today, I was wondering about having seen so much nonsense on twitter. Did you notice the race for followers on Twitter? “How many do you have? Some people are crazy with their I follow you back strategy. All they do is brag with their stats. I think this is useless. That makes them followers, sheep-walkers. Isn't it the quality of contacts what really counts? Following 4,567 randomly chosen people is nonsense. And being followed by 2,456 doesn't mean anything, if those people don't care about what you have to say. What should a leader do? Probably connect with other leaders and communicate with them. When you constantly tweet content that matters to some people, they will find you and follow you naturally. That said, the profile of a leader looks more like this. Update: I just received an interesting questions. Posted by John W. Furst in Marketing, Seth Godin on Thursday, December 18, 2008 has got 9 Comments. Seth Godin has just announced and published the second e-book created by his online community -- his Triiibe. If we have left something out. Let us know. Leave a comment here on the blog. Yes, I can say “we”. I am one of the many contributors. Maybe the Polish former president Lech Wałęsa will call me up and say, “Dziękuję” (Polish, English: Thank you), because I am responsible for getting his name into the e-book. Lech Wałęsa was an ordinary electrician before he became the tribe leader of Solidarność (Solidarity), the first independent union in formerly communistic Poland. Tribes work in politics and they work in business and other areas. It's based on human nature. Then drop me a note or a comment here on the blog and I will try to get you an answer. I have the power of Triiibes backing me up. Personally I am most interested in application of the tribes concept for marketing and business. A couple of weeks ago, I have written a review about the book Tribes, and I have linked to the case-study e-book. You might want to check it out. You also can buy the book Tribes from there. If you haven't already. Posted by John W. Furst in Coaching, Marketing, Seth Godin, Top Posts on Monday, November 17, 2008 has got 5 Comments.